Guitarist Eric Kesner presents a unique collection of dark ambient meditations in his recent work "(Absence)". Deep, quiet and patiently beautiful, "(Absence)" eminates drifting and enduring reverberations which reflect a haunting, tranquil, wordless exchange between internal selves of a profound and imaginary communication. Dense, ambient feedback tones penetrate and reverberate, slowly building upon each other and echoing away. The sonorities are simple and clear, the gestures sweeping, natural, deliberate. Ever-so-slight imperfections and arrhythmic resonances sometimes find their way through and add a living, breathing feel to the sound. Some pieces bury bass murmurs so low you will need a 16" speaker to fully appreciate their depth. 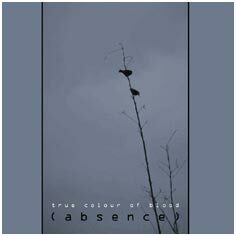 But the true allure of "(Absence)" is how consistent and inexpressably subtle it remains throughout; simple, resonant and entirely effective. Some emphasis has been placed by the artist and others commenting "(Absence)" and other True Colour of Blood works consist of nothing except guitars and effects processors (no synths); in the end this is really an insignificant point. Whatever the methods and tools, "(Absence)" is a mature and involving work that captivates and invokes a deep and reflective beauty.